Do you want to get something off your chest? Both the past and the future of a man depends on man’s decision how to run the life through. There is no possibility to change past but future. Events and behaviors, sins of our past are the things we are responsible for. Each religion has its ways to forgive the sinner. But the question is not, what are the ways but how much sincere are you in order to be forgiven. Hard to say but there is not an ordinary man without sins. What are our sins? Christian teaching lists 7 deadly sins. Looked the list through? Found yourself guilty? What is the resolution of the problem? One should master his/her courage and confess the sin. Where to do that? Well, everybody knows that, but the question is that modern technologies provide us with the “alternative” sources of relieving from our sins. I am not sure would one be forgiven by God if he fills the frame and confesses the sin on http://www.harlequinromancereport.com/ but it claims to be friendly Web site, and offers people to let IT out sans the fear of being found out. The initiator of this idea is one of the largest publishers of romantic fiction, Harlequin Enterprise. Confessional section of the site is divided into 8 sub-sections. Asks whether you are over 18 or not, lists 7 deadly sins, and allows you to vote for the category of deadly sin and fill the frame with the description of it. “Do you want to get something off your chest? Admit something you've never told a soul? So visit http://www.harlequinromancereport.com/ find out some statistics and wait for 2008 Confessions report. The great variety of languages confronting an average person every single day have created a lot of headache. Especially if the boss is strictly demanding translations of a document at his desk till the end of the working day. If this is a way things are done at your job, you should hear good news from Fuji Xerox - which has begun to produce photocopy machines translating the Japanese text into Chinese, English and Korean. The copying machine is connected to the translation server. It is equipped with the hardware containing algorithms, which can distinguish between the written text, lines and pictures, so as the original layout of a newspaper, a magazine or a document will be preserved. 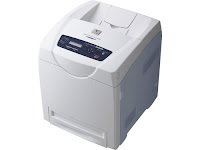 Unfortunately for the tired office workers all over the world, the miracle-copying machines are currently available only in Japan. Whether the new invention will do a better job in the matters of syntax as compared to Babel Fish or Google Translate, is still unknown. However, the hopes for better future still rest with the Fuji Xerox new copier. It looks like businesses have finally started embracing web 2.0 principles. At least, Cisco Systems is actively moving into this direction. On Thursday, Cisco announced that the company plans to acquire Latigent, a Chicago-based business intelligence and analytic reporting tools provider. Latigent was co-founded in 2002 by CEO Chris Crosby and CTO Jason Kolb, who will both join Cisco after the close of the acquisition. The acquisition is expected to close in the first quarter of Cisco's 2008 fiscal year. With this move, Cisco will be making a push into Web 2.0. Web 2.0 applications have already proven that when it comes to collaboration, the principles underlying web 2.0 are effective. Microsoft Corp’s Video Game -“Halo 3”outdid all the video games, and movies and set an opening-day U.S sales record of $170 million. “Halo 3” overcame even movies such as Spider-Man 3 -$59 million, 'Harry Potter and the Deathly Hallows', and ”Halo 2” too-$125 million, Wedbush Morgan Securities analyst, Michael Pachter estimates that 2.5 million copies were sold starting with midnight store promotions coast to coast, meaning one-fifth of all Xbox 360 owners bought a copy in the first 24 hours. "I would guess that the number is 1 million higher in a week, and double by year end." GameStop's Bob McKenzie calls Halo 3 the biggest title in the history of the 4,400-store chain. And Best Buy's Brian Lucas says: "It's safe to say Halo 3 is on track to be probably the biggest gaming title that we have ever seen. It's definitely a phenomenon." "Halo 3" is targeted firmly at the Xbox's core male audience, for whom realistic combat games are a staple. Halo 3 is launched in 37 countries and is available in 17 languages. It retails for around $60. In the last 20 hours over 1,7 million copies were pre-ordered in the US. Recently a new European Web 2.0 social networking site called MyPacis.eu has been launched. MyPacis.eu uses Web 2.0 tools which are very attractive for younger generations, but still accessible to more mature ones. Overall, the website offers many web 2.0 tools (blogs, photo galleries, member profiles, videos, real-time news, etc) found on other social networking web sites. However, compared to existing social networks in Europe, MyPacis.eu has been designed to be easily localized in every European language, instead of focusing on one or two national markets. A Montreal-based internet start-up company Praized Media Inc announced today that the company has secured $1 million funding from Garage Technology Ventures Canada. The start-up operates in a stealth mode and at the moment it is unknown what company's exact product will be. However, it is known that Praized Media Inc. is working on a sofware that will connect blogs, social networks, and local search in ways never seen before. What Is the Result of Reversing Following Combination of Letters YENTIRB SRAEPS? Will not make you lose time and say that it is Britney Spears. Well, if I list all the links existing in the world of internet, I should say that there is no time and patience. There are about 41,600,000 results spread over 100 pages. Just type Britney Spears. I am not a fan of her. But Even if you are not, it is impossible not to hear about her on TV, Radio, Newspaper, Internet. The latest news I came across about her is that she hit the parked car and was charged with misdemeanor hit and run causing property damage. She's also charged with driving without a valid license. Seems she had left neither note for the driver of the vehicle, nor police report. There could have been known nothing about this accident if not the video. It shows that pop star is much more concerned with the damage of her own car rather than the other drivers’. According to the California Vehicle Code the owner should leave their information in a conspicuous place and inform local law enforcement of the incident. Britney Spears faces six months in jail or a $1,000 fine for each of the misdemeanor counts. The arrangement is set for October 10. 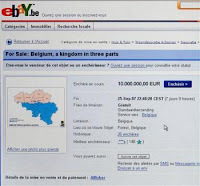 The famous site of electronic sales, "EBAY" recently withdraw the declaration Belgium on sale from their list. The announcement was published on the 15th of September. Just in several days price of Belgium had increased from the initial price of 1 euro to 10 million euros ( 13.9 million $ ). The author of the advertisement, a former journalist Geritt Seks divided Belgium into three parts (Flanders, Brussels and Wallonia ) and put them on sale separately, since according to him, purchasing the whole country would be too expensive. The most amusing detail in this entire story is the fact that Seks warned the prospective owners about the 300 million national debt. In case of purchasing separate pieces of Belgium, each new owner would have to pay just 100 million euros each. The Spokeman of the EBAY say : this is not the first time Belgium is put on sale. Well, it seems so. At least, Apple has forgotten that there people with ear disabilities out there. When iPhone is held up to a cochlear implant and or a hearing aid it gives out a loud buzzing interference. Due to this problem, a group representing people with a hearing loss filed complaints with the U.S. Federal Communications Commission last month. The group is accusing Apple Inc. of not making its iPhone compatible with hearing aids. This complaint may turn pretty expensive for Apple. Results may vary from paying refunds to customers with disabilities to redesigning the device altogether. However, according to documents posted on the FCC's Web site, Apple may not be required to make changes to the iPhone. "Handset manufacturers that offer two or fewer digital wireless handsets in the U.S. need not comply with the hearing aid compatibility compliance obligations," the FCC states. Stanford University's Folding@Home program studies proteins to understand their goal in cancer, Parkinson's, Alzheimer's and other diseases. Of course, this kind of research requires enormous computing power. The University's network has been running 200,000 computers. PlayStation 3 owners are able to hook their consoles to the network and help the program accomplish its goals. Since March 15, 600,000 PlayStation 3s have been connected to the program delivering a petaflop performance to the university's network. The software to connect PlayStation 3 to the network is provided by Sony. The application is free and donates computing power from your PlayStation 3 to the network when your console is idle. PlayStation 3 is an extremely powerful machine, far more powerful than average home computers. PlayStation 3's multiple 3.2 GHz cell processors deliver nearly 1.8 teraflops of computing power. You are deleting a lot of files from your computer every day, and some time later you again find yourself regretting about the deletion of some of those files? Well, not any more! 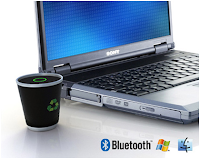 The designers have invented a new dustbin connected with the desknote via an Wire-less connection or Bluetooth. The new recycle bin is equipped with a special CD connected to your computer. Every time you are deleting a file from your computer, a copy of this file is sent zipped to the dustbin. After being entirely full, the dustbin will send a signal of alert, requiring some files to be removed permanently. The project of the new dustbin is still placed on the designers' shelf, waiting some big company to purchase the design and to provide the new invention to the global market. According to the predictions of Gordon Moore by about 2020 his Law will come up against the laws of physics. "Another decade, a decade and a half, I think we'll hit something fairly fundamental,"declares Gordan Moore on the Intel’s twice annual conference. As we know the Silicon-based manufacturing is known as “bulk CMOS,” it is more like a ‘top-down’ approach. But as Jim Tully, chief of research for semi-conductors at Gartner, says, in bottom-up approach the chips will be assembled using individual atoms. The main issue that should be covered is that programs should take full advantage of advanced technology. Otherwise there is going to be no benefit from it. Gordon Moore in his seventies wishes to “come back in 100 years from now and see what has been developed.” And who does not wish? According to NPD Group's video game sales data for August, Wii and DS are still the top sellers. However, after price cut on Xbox 360, sales of Microsoft's game console have boosted by 63% and have surpassed PlayStation 2 sales. If we take into account that both PlayStation 3 and Wii sales have declined in August, Xbox 360 sales dynamics are pretty impressive. Moreover, the release of Halo 3 is expected to further increase Xbox 360 sales. Today European Union court dismissed Microsoft's appeal against an EU antitrust order that ordered it to share communications code with rivals and sell a copy of Windows without Media Player. The court upheld a $689 million fine as well. The software giant has two months to appeal the decision to the EU's highest court, the European Court of Justice. The company lawyer didn't say whether Microsoft will or won't appeal. Scotland has lost a national hero and the motorsport world - a man with extraordinary spirit. Rally legend Colin McRae along with his five-year-old son died in a helicopter crash on Saturday. 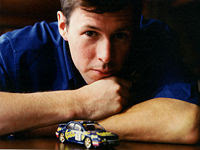 McRae became the first Briton to win the World Rally Championship in 1995. McRae was devoted to motor sport with his heart and his soul. He has taken part in Le Mans, Paris-Dakar and even piloted Martin Brundle's Formula 1 car. 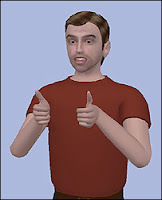 McRae is extremely popular in the world of computer games. The first Colin McRae Rally was released in 1998 by Codemasters followed by the second release in 2000. The second release was available both for PC and PlayStation. The latest game DiRT's PlayStation 3 edition was released on 14th of September, day before McRae's death. All of the games were inspired by the legendary driver. The world of motorsport will never be the same without McRae. That is a very good question with variety of answers. While searching for information about patents and plagiarism facts, one can come across to tenth of web pages of different countries, different prices and different conditions , with different obstacles about patents. The UK Intellectual Property Office provides following prices for: the process of the patent - GBP 200, a preliminary examination - GBP 30, a search - GBP 100, and a substantive examination - GBP 70. As for the Cornell University Law School provides the information about Patent Law. - Free registration on our web site - Create a project for your know-how- Describe your know-how most detailed including its newness, benefits, features etc. Online-Witness provides the evidence in the form of on-line certificate. The certificate provides the information, when and whom was the work, invention, or idea presented by? Online-Witness guarantees that the online version of the certificate and the paper copy signed and stamped will be produced automatically upon the request. Online-Witness is the third party witness that has the acknowledgement that the product, idea or invention was registered at the certain date. Types of the information that are available to post on the web site are: Textual, graphical, Binary Files. There are several reasons, why one prefers to choose exactly Online-Witness to protect his or her, works, ideas, inventions... Free, Quick, Accessible. Let me pose you a simple question. What will you get if you combine 60% entertainment, 35% "facts you never knew you didn't care about until now" and approximately 5% serendipitous connection to things directly related to you? Okay, let me give you one more hint. Dale Carnegie has said: "Remember that to him or her, a person´s name is the sweetest most important sound in any language.". I guess you are guessing what we are talking about. Yes, about our names. Did you know that you could so many things with your name? A couple of ideas. You can translate your name into different languages, for example into Latin. You could count vowels in your name. You could rhyme your name. Well, the possibilities are endless. But don't beat your brains. I'll show you a better way to get fun with your name. Here we go dear. Open up your browser (pardon, I guess you have already done so as long as you are reading this post) and visit http://www.isthisyour.name. Then simply, type in your first name and last name and get a maximum pleasure with the "sweetest most important sound in any language". Sahara Computers and Electronics Ltd. (SCEL) is the largest joint venture between Sahara India Pariwar (SIP) and Sahara Computers (Pty) Limited, South Africa (SSA) in India . It produces computers, laptops and peripherals. The new product that Sahara is going to launch is a new range of Sahara laptop and desktop computers. The company is going to invest over Rs 100 crores to develop strong network that covers Indian market and create retail stores for the products. $100 million in fines and 0 points in the 2007 season's constructors' championship is FIA World Motor Sport Council's final verdict for the McLaren-Mercedes team. McLaren-Mercedes drivers Fernando Alonso and Lewis Hamilton have not been penalized and are free to continue their fight for the drivers' title. We expect the FIA to explain the reasons behind the Council's decision today. This should be followed by McLaren's decision to appeal or not. On the Formula1.com website there is a poll about the verdict. It seems that the public opinion is divided evenly with a slight advantage to those who think that the decision was fair. I too believe that the decision was fair. I would be extremely disappointed if the verdict had affected McLaren drivers. Both Alonso and Hamilton should have a right to fight for the title. Ferrari is satisfied with McLaren verdict. No surprise here. Scuderia has practically secured the championship title in this year. Hopefully, the spy saga will be over and everybody will pay attention to the battle on the circuit. Let's hope that this case will be the last in the history of Formula One. The most important feature Parrot Party Bluetooth speaker has is that there is no need for installing different software to send the play list to the Party Bluetooth speaker, it is able to stream device to Cell Phone, Personal Computer, CD players. Price of the product is not decided yet. The main advantage of The Quad-Core AMD Opteron™ processor is that it turns off all the unused parts of the processor that is more energy efficient, and it has Dual Dynamic Power Management system that supplies power to the memory controller. It looks like that in Formula One the battle from the circuit has shifted towards the court rooms and FIA World Motor Sport Council summits. Tomorrow may prove to be a crucial day for the leading team. If the McLaren-Mercedes team is found guilty, not only does the team face multi-million dollar fee, but potential punishment includes disqualification from this season and from the next as well. Not a promising outlook for the British-German team. Unfortunately, some sources speculate that McLaren will drag other teams as well in the case and will require adequate sanctions against such teams. According to the sources, Flavio Briatore's team is the one that McLaren will try to drag into the case. But the Renault boss is calm and accuses his vis-a-vis at McLaren Ron Dennis of “throwing stones everywhere” in an attempt to deflect pressure. This might prove to be a good strategy for McLaren to shift attention from the main point but it might turn to be a critical decision as well. But what do we, passionate Formula One fans gain from this? I have been a big fan of Formula One for many years now and the royal sport is experiencing degradation. Come on guys, be serious about the sport. Concentrate your resources and energy on your cars, drivers, the team. 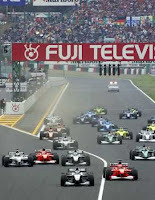 We like Formula One because of the joy that it brings to us on the grid not in the room. We love observing the battle of your pilots, not the battle of your lawyers. People interested in modern trends always seek news and try to be absolutely involved in the world of changes. But there are thousands of professional sites that serve the publics right to know. But different spheres are of different importance according to the interests of the users. There are hundreds of web addresses I visit during a day. One of them was Journalism.co.uk. The first thing I noticed was the color garish green that is changed to gray. It is more convenient to search for the information on the web now. The Journalism.co.uk made some changes in content management, too. 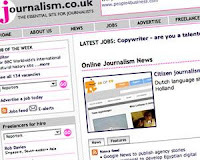 Alongside News, Jobs, Advertising, freelance, Training, Events and Awards the web is added tabs for the recommendations of related news on other sites and J-blogs. 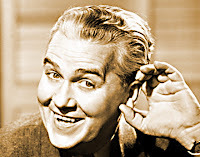 Journalism.co.uk lists Best of journalism Blogs. Each change should bring innovation and new attitude to the issue. As it is mentioned above the worth of Journalism.co.uk is $268,721.04. Let’s visit Dane Carlson’s Business Opportunities Weblog and investigate direction of future changes. This article has been featured on MediaPath. There is good news for prospective brides and grooms in India. Thanks to SimplyMarry.com, your dream hubby or wife may be just a click away. India's fastest growing matrimonial portal is promoted by The Times of India group, the largest media & entertainment conglomerate in the country. SimplyMarry.com's mission is to become a one-stop platform for prospective brides and grooms to meet and communicate with each other. The web site uses the latest technologies, is marginally easy to use and is very user-friendly. Getting married is a serious enterprise, but SimplyMarry.com makes it so much fun. You can join SimplyMarry.com absolutely free of charge. Though, to take full advantage of the platform, you can upgrade to a platinum or diamond membership accounts. The fourth annual Web 2.0 Summit will be held in San Francisco on October 17 - 19, 2007. John Battelle of Federated Media and Tim O'Reilly, CEO of O'Reilly Media will moderate the conference. The event is co-produced by O'Reilly Media and CMP Technology and this year's conference theme is "The Web's Edge." Speakers include Randall Stephenson, CEO of AT&T; Steve Ballmer, CEO of Microsoft; and Mark Zuckerberg, CEO of Facebook. News Corp. CEO Rupert Murdoch and MySpace co-founder Chris DeWolfe will have a "dinner keynote conversation." eBay CEO Meg Whitman will be participating as well. eBay is a gold sponsor of the event. The International Automobile Federation has issued a statement according to which, the federation had summoned their World Motor Sport Council again for a hearing in Paris on September 13th to consider the development of a Ferrari-McLaren spy case. The meeting on the 13th is in effect replacing the appeal hearing, which has been filed by Ferrari after the WMSC decided not to punish this year's leading team in July. The situation up to date is that McLaren was found to be in possession of Ferrari's confidential 780 page material. However, as the WMSC has found, the team has not benefited from it in the championship battle. FIA's representative has mentioned that new evidence had emerged in the spy case but the representative has not made any comments. The bottom line is that if McLaren is found guilty, the team may get disqualified not only from this, 2007 season, but from the 2008 season as well. So, quite much is at stake for the McLaren-Mercedes team, which at the moment is leading the constructors' championship by 11 points to Ferrari. Here we have another surprise from Apple. On Wednesday, Steve Jobs announced that the company was cutting the price of the 8GB model by 33%, which makes a whopping $200. Thus, Apple's miracle device 10 weeks after its launch costs only $399. Customers are angry and so are company's investors. How can this move be explained? The first idea that comes to mind is that Apple is not able to meet the forecasts and has taken more aggressive marketing action. However, I see a different picture here. I strongly believe that in business succeed not the best products but those products which are accompanied by the the biggest buzz and hype. In our complicated world, marketing is something almost a mystical thing. Little marketing details can make dramatic difference. Let's notice a couple of things. 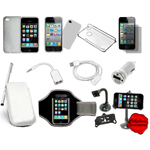 Have you noticed how many blogs, websites and shows are devoted to iPhone? I can't remember any other product with such a huge buzz as Apple's iPhone. I must say that Steve Jobs did the most marvelous job in this respect. The deal was made with AT&T only. Boom, the phone is locked for any other carrier. Want an iPhone? You are welcome to grab one, come and subscribe to AT&T. Want to use the device with other carriers? No problem, do some hardware tweaking and the phone is unlocked. Don't want to deal with soldering? Oh, there are already at least a couple of different alternatives to unlock the phone at the software level. Had it be possible to use the phone with other carriers, that lucky guy would not have got a brand new car for his unlocking software and gazillion of bloggers would not have been able to write nice posts about this fact. How many blog posts, news articles and rumour has arisen about unlocking iPhone? Countless!!! The phone doesn't have support for Java. Is it good or bad? After all Java game development industry is estimated to be a billion-dollar industry. But let's sacrifice ability to use Java software on iPhone to the hype and buzzword and as a side effect to stability of the device. No, no and again no. We are still not able to sell as many iPhones as we would love to. What do we do next? Yes sure, let's cut the price by $200. Wait, you can buy many different cell phones under $200 and this guy is reducing the price by $200. What about those people who have paid original price? Good news for them, if they have not opened the phone they can take advantage of the Apple's refund policy. But how did the investors react? They did exactly as expected. Apple's share prices dropped by more than 5% just overnight. That's bad but the action (price cut) leads the company to even more aggressive marketing campaign. At the same moment Apple introduces an array of new digital products. All in all, I see that Apple is playing a risky but well thought out marketing game. Where will it lead? Oh, we only have to wait and see. 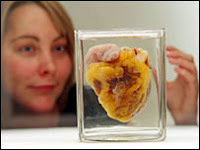 When your own heart upsets one should place it on the Wellcome Collection in central London. Why? Thousands of people suffer from different types of heart diseases. Each of them are different individuals, with different responsibilities, demands but of the same wish to have healthier Heart. 23 years old, Jennifer Sutton is one of those who suffered from restrictive cardiomyopathy. She saves her life by donated heart. Today she lent her heart to the Collection. Exhibition’s mission is to emphasize the medical and cultural significance of the heart and increase the awareness of organ donation . Four out of 10 deaths in the UK are from heart and circulatory disease, according to the British Heart Foundation. On average heart patients wait 103 days for a suitable organ to become available. Last year 28 patients died while listed for a heart transplant. The Wellcome exhibition, which runs until 16 September, includes work by artists Leonardo da Vinci and Andy Warhol, and the Egyptian Book of the Dead. If you belong to the generation that had cell phone in the pocket, the question may sound quite valid to you. What do we really need in our pockets, a phone to make phone calls or a tiny computer? Modern mobile phones, better known as smartphones, are really complex devices with full featured operating systems, various applications and a lot of functionality. But do we need all that? I like changing mobile devices every three or four months. My current device, Fujitsu-Siemens Pocket Loox T830 is an extremely advanced device with almost all possible means of cummunications (Wi-Fi, Bluetooth, GPRS, 3G, GPS) present on-board. The hardware is quite fast and the device runs a Windows Mobile 5.0 from Microsoft. Unfortunately, often in critical moments the device simply crashes or halts and I'm simply unable to do the major function of the device - to make a phone call - without restarting the device. I believe this is what Steve Jobs meant when he explained why there would be no Java present in iPhone. Yes, it's true that Java development (especially gaming) may be a multi-billion dollar industry and it also may be true that Jobs has lost his grasp on reality again but he is right. Java is slow, bloated and not very reliable. On the other hand, we cannot simply ignore the fact that Java is an extremely widespread development platform for mobile devices. So the big question is what we really need. If you need a simply cool multimedia phone and third party applications are irrelevant to you go for iPhone. If you need an all-in one device (yes yes, FTP client, Newsreader, Remote Desktop, even a Bittorent client are some of the applications that I have on my mobile phone) then go for a Windows Mobile or Symbian device. According to MaltaMedia.com, an undisclosed amount of counterfeit DVDs and PlayStation games were seized in a Police raid held at the Valletta open market on Sunday morning. Interestingly, 2,400 counterfeit DVDs and CDs were seized during the previous raid held at the Valletta open market in May. I spent my vacation in Malta in August and the island is really nice. I did not have a chance to visit the Valletta open market but got a couple of PSP games at the baystreet and the disks were genuine. So, I guess it's at the open market where you can get pirated disks. Anyway, Malta is not in the list of countries that USTR has placed either on a Priority Watch List or a Watch List. Ubisoft's upcoming sci-fi first-person shooter Haze will be available for Playstation 3 only. No PC, no XBox, no Wii. The company has already stated that it does not have any current plans to bring this game to other consoles and the PC. Originally to be a multiplatform game will be available to Sony PS3 exclusively and will be released in November of this year. If the game turns out to be a successful one, it will seriously boost PlayStation 3 sales. PS3 needs a couple of successful exlcusive titles and I believe Haze will be one of them. An Indian businessman and a member of the upper house of the Parliament of India, Vijay Mallya has acquired the Spyker F1 Team. Mallya, who is the chairman of the United Breweries Group and Kingfisher Airlines puts India back on the F1 circuit. Not only will India be mentioned in the updated name of the company, but this will give a perfect chance to Indian drivers to be on the circuit. Especially, this might turn to be a golden opportunity for Narain Karthikeyan. India still hopes to secure a place in the Formula 1 calendar. The nearest opportunity is 2009. However, Mallya is already expecting a German designer Herman Tilke, who has done Bahrain, Istanbul and is now working on Singapore. Tilke will be flying to Delhi on Monday and will check the suitability of two-three sites. Sony has announced that the company will decrease prices on PlayStation 3 in the US market. The price will be cut as soon as the older models are sold out. In one of my previous posts I have analyzed the gaming console market. The competition is extremely tough. This month, Microsoft and Nintendo cut the price of the Wii and Xbox 360 by $50. Total sales were 425, 000 and 170,000 respectively for the Wii and the Xbox 360. Sony's decision to cut price on the new model shall further boost sales.